Throughout the Malone University Campus in Canton, Ohio, a growing gaggle of geese has been camping out on walkways and lawns, honking and even attacking some students as they walk to class. Some unfortunate students have even stepped in the green-colored droppings left by the noisy intruders. The Canada geese have been congregating between Cattell Library and Mitchell Hall. In some instances, geese have completely blocked sidewalks. While the hope is that the geese are just visiting, one faculty member who teaches ornithology noted that some populations of geese remain throughout the year in Ohio. Drawn by the manicured lawns, tasty vegetation and the absence of predators, the geese are likely to call this campus their home. While there are no large bodies of water on campus, experts believe the geese, like the ducks before them, will adapt and make nests there. Campus officials worry that once the geese take to nesting, the campus will be overrun since geese are prolific reproducers. The other concern is that Canada geese are protected by the Ohio Department of Natural Resources, so permits are needed to hunt them out of season or destroy their eggs. So far, campus officials have considered resorting to dogs, scarecrows and lasers to get rid of the geese. 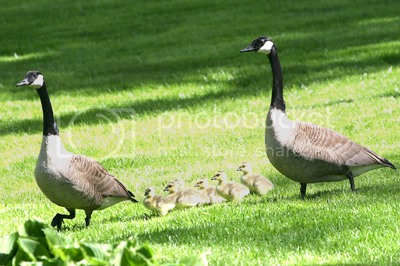 Malone’s Director of Physical Plant suggested some goose controls but these were considered inhumane. A Department of Natural Resources publication noted that hunting virtually eliminated Canada geese from Ohio by 1900. But by 2000, the Division of Wildlife estimated there were 84,000 Canada geese in Ohio. Broadcasting pre-recorded goose-distress calls, the Goose-B-Gone Super Sonic system intimidates geese over a wide area. The system comes with one internal speaker that covers a full acre and more speakers can be added to cover up to five acres. The Goose-B-Gone Super Sonic is fully programmable to operate between 65 to 105 decibels and can be turned on or off at night. The system is ruggedly designed for outdoor use, with UV-protected materials to endure harsh sun and weather. Turning a goose food source into a sour-tasting substance, Migrate Goose Repellent transforms grass areas and shrubs into a natural repellent. This non-toxic liquid is easily applied by grounds crew and won’t harm people or pets. Its active ingredient is Methyl Anthranilate, a harmless grape extract that irritates a goose’s trigeminal nerves and mucous membranes. One or two bites of a chemically treated lawn or shrub will make geese think twice about considering campus lawns and shrubs as a food source. Migrate lasts up to three months outdoors, and won’t wash off with rain or sprinklers. One gallon covers about 16,000 square feet for one application. Northern Illinois University has been invaded by geese. The fearless birds seem to be everywhere on campus, walking on the sidewalk outside DuSable, paying no mind to buses and cars, picking at trash on the ground–the problems are almost too numerous to mention. The geese return to NIU every year. One goose, known as Boris, after having settled near the Chick Evans Field House, would chase, bite and squawk at all passersby. 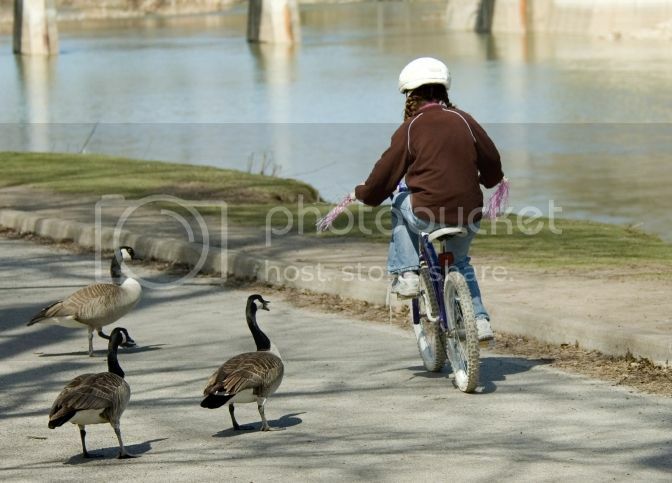 The geese also cause dangerous traffic situations. The large birds routinely take over crosswalks, stopping buses, cars and motorcycles, causing near collisions. Nesting on residence hall roofs, taking up sidewalks and crosswalks, these geese have literally taken over the campus. Canada geese are big–they can weigh up to 24 lbs.—and also quite aggressive, chasing students and pets with an annoying “honking” noise. In flight, geese can reach speeds up to 50 mph, so they can injure people who don’t duck out of their way. Since they are territorial birds, they will protect their nest and eggs from a human or pet. Goose droppings can carry diseases, including histoplasmosis, toxoplasmosis and giardia. The parasite larvae crawl onto the skin and burrow under it, creating a red itchy rash. To keep geese off campus, you’ll need some serious goose deterrents. Banging pots, shooting BB guns and leaving poisons are ineffective and dangerous. Fortunately, there are several deterrents that are both humane and effective. Broadcasting pre-recorded goose distress calls to deter geese from outdoor areas, Super Sonic Goose Deterrents feature a built-in speaker that covers up to an acre of land. These sounds are repeated every ten minutes to warn geese of impending danger. When geese hear these calls, their natural instinct is to leave the area. You can add more speakers to cover larger areas. The best sonic deterrents can be programmed to shut off automatically at night. Incidentally, ultrasonic deterrent devices are ineffective, since geese can’t hear these high frequency sounds. Geese love to nibble on shrubs and lawns. Goose Repellent makes grass areas and shrubs inedible to geese. The liquid repellent is non toxic and safe to use around people and pets. It uses a non-toxic grape extract (Methyl Anthranilate) that irritates a goose’s trigeminal nerves and mucous membranes. One gallon of Goose Repellent covers approximately 16,000 square feet and lasts three months. It can be applied with any simple hand held sprayer. These motion-activated sprinklers hit geese with a “Hello” but harmless blast of water whenever the birds wander into their radius of protection. The combination of water spray, startling sound and realistic looking bird head convince even the most stubborn geese to disperse and avoid the area. Scarecrows are easily connected to any garden hose, and their sensitivity and blast radius are easily adjusted to suit the specific venue. Scarecrows typically cover an area of about 1,200 square feet (35-foot by 45-foot wide). And you can get up to 1,000 “firings” on a single 9-volt battery. Bird strikes at airports are not uncommon and can end in tragedy. The Telegraph recently reported a plane crash in Napal that took the lives of 19 people when a vulture flew into one of the engines as the plane was taking off. Tragedies like these underscore the importance of effective bird control. Civil Aviation Authority officials noted that the pilot was forced to make an emergency landing after the plane’s front engine had been hit by a bird and ceased to function. After trying to start a second engine, the damaged engine burst into flames. When the pilot attempted to land in the nearby Monahara River (to snuff out the flames), the plane crashed into a soccer fi eld on the riverbank and was engulfed in thick, black flames. The plane crashed just 500 meters from the airport. Luckily no one was on the ground in the plane’s path. It took firefighters over 40 minutes to extinguish the flames. It was later determined that the bird was not sucked into the engine, but hit the right side propeller. A local engineer noted that 90 percent of bird strikes occur during ta keoff. Bird collisions can result in aircraft damage, especially if the bird is large and is ingested into a jet engine. In this case, a bird will damage a fan blade in the engine, which causes adjacent blades to displace and impact all the blades in the engine. Without effective bird control measures, airports are literally at the mercy of pest birds. Since most aircraft hangars are wide open during operating hours, birds can easily flock around door openings, overhangs, eaves, canopies, support beams and other lofty areas. Birds attracted to hangars include European starlings, house sparrows and pigeons. Once they begin to nest inside, their droppings and nesting materials can easily fall onto aircraft engines, maintenance and testing areas, and parts storage bays. Parts contaminated with bird debris can fail during testing and even cause mishaps during flight. Workers can also slip and fall on bird droppings. One popular bird deterrent currently used to keep birds out of aircraft hangars is Heavy Duty Bird Netting. Correctly installed by Authorized Bird Control Installers, bird netting effectively prevents birds from accessing sensitive areas. Heavy duty bird netting comes in a variety of mesh sizes. To block out pigeons or seagulls, consider using 1-1/8- to 2-inch mesh size netting. To seal out smaller birds like sparrows, a 3/4-inch mesh netting is recommended. Bird control experts will tell you that it’s important to specify high quality netting. The best heavy duty netting is made of high-strength polyethylene. One manufacturer offers netting that has a burst strength of up to 40 pounds. It meets ISO 1806 and 9001 protocols, is UV stabilized, flame resistant and rot- and water-proof. The best netting will have a 250-degree Fahrenheit melting point and will also remain intact in “sub-zero” temperatures. This netting is black, comes with a 10-year guarantee and is virtually invisible when properly installed. Installing heavy duty netting in aircraft hangars should be done properly by Authorized Bird Control Installers. Such installations typically require thousands of square feet of netting. For example, to properly install the netting horizontally across an entire hangar ceiling, special boom lifts and power gear are required. Improperly installed netting can droop and sag, allowing birds to enter through spaces. Properly installed, Heavy Duty Pond Netting creates a physical barrier that prevents migratory birds from landing in ponds or other water areas around aviation facilities. The netting is made from a durable, UV-stabilized Dupont® knotted mesh nylon and designed for prolonged use in harsh environments. The netting comes in large stock sizes and custom cuts. Mesh sizes vary from 3/4” to 4” to exclude a variety of large and medium sized migrating birds. Ideal for repelling birds from large expansive areas like airports, Avian Control™ Bird Repellent is a non-toxic solution that discourages geese, gulls ducks starlings and other birds from gathering and grazing. Avian Control’s unique patent pending formula irritates the mucous membranes of birds, yet it’s harmless to birds, pets and people (all ingredients are considered “Generally Regarded As Safe” by the FDA). It lasts up to three times longer than other goose deterrents. The repellent can be sprayed and is highly economical when fogged (fogging uses just 12 to 16 ounces per acre). Avian Control™ should be applied by a licensed pest control operator. For additional advice on how to prevent bird strikes at your airport, consult an expert like the folks at Bird-B-Gone.